January Sale!! 15% off RRP for 15 days starts 15th January. We've decided to kick start the year with a sale... New year, fresh start! 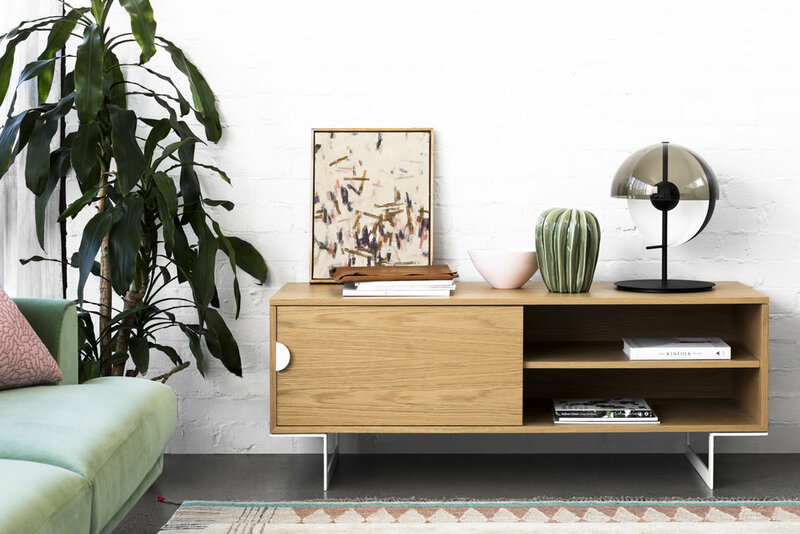 So if you were thinking about replacing your old sofa or gift yourself a couple of handy side tables or keep things tidy in the lounge with a minimalist sideboard, now is the time! *Applies to the whole range for new orders only. Only 10% off applies on our Emi pods. Discount does not apply on delivery costs. Order confirmation and 50% deposit must be received by 5pm on the 30th January 2019. Lead-times vary. Contact us for enquiries and pricing or fill in your details below. - Our Camille sofa was released in June 2016. - It is the first sofa in our range (yes also the only one but not for long). - Originally designed for a more residential market, it turned out to be also perfect for more commercial situations. - It can be customised as a modular setting. - Leather upholstery is also an option. - It has a mid century modern flavour but mixed with more contemporary features. Dress it up or dress it down. The velvet upholstery gives it a sophisticated look but it also keeps a relaxed appearance. If you are after a more tailored style, go for a textured or plain wool. There are so many options out there, so we have a curated a few fabrics and colours on the website's brochure as suggestions. - I worked in various furniture showrooms before starting anaca studio. Being in direct contact with the end clients has given me some valuable insight on what they were looking for, what they liked or didn't like when trying out sofas. Main point: most sofas are often too low to the ground and also too deep making in hard to get out of. A super deep sofa sounds great in theory but the reality is different as they can make you slouch and generally offer very little back support. Something else people wanted was higher backs to get more support at shoulder level. Comfort is a very personal thing and what works for one person doesn't necessarily apply for another. But for our fist sofa, I wanted to address these key features I had learnt about. So with all that precious information in mind I worked on the proportions, the design and the detailing, and used the knowledge and experience of my clever upholsterer to achieve in the end not just a good looking piece but also a sofa that is REALLY comfortable. Planning a visit to the studio to try it out and chat about the options? Being out and about often visiting clients or manufacturers means that the studio is open by appointment. Give us a call or drop us a line if you want to pop in, we’ll work around you. Two years on from our last major launch, our signature style continues to evolve. Taking time to bring out new designs has allowed us to develop some more meaningful additions to the range. So back in June at Denfair, we welcomed four new members to our furniture family. This year’s collection maintains the relaxed sophistication and evocative curves synonymous with the brand, while introducing a fresh, subtly masculine appeal. 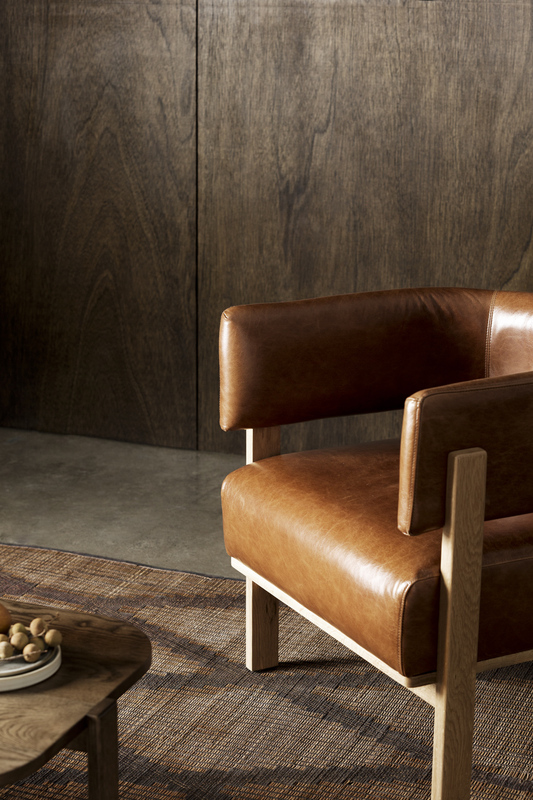 The Flo Armchair makes for a handsome addition to any space, particularly in sumptuous Italian leather which invites you to sink into its compact yet comfortable timber frame. Teamed with the refined silhouette of the customisable Flo Coffee Table, or a simple statement Poppy Side Table piece, the combination works effortlessly together as a complete casual sitting solution – an intimate nook in a style-savvy home, perhaps, easily scaled up for a commercial interior. 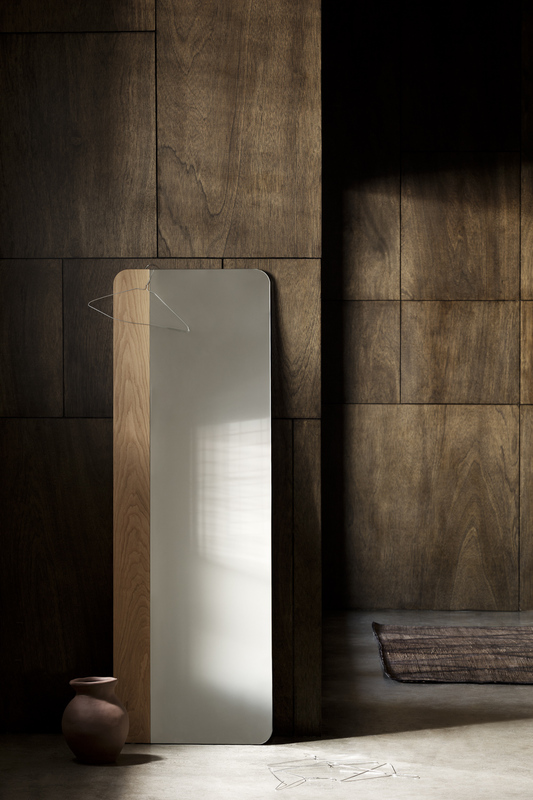 The Narcisse Mirror, by contrast, is a standalone piece which elevates any space with its understated glamour. The new products come in an wide array of finishes, fabrics and sizes. We are committed to collaborating with our clients to ensure that each item of furniture can be adapted to suit any interior setting, whether that be in a residential or commercial environment. 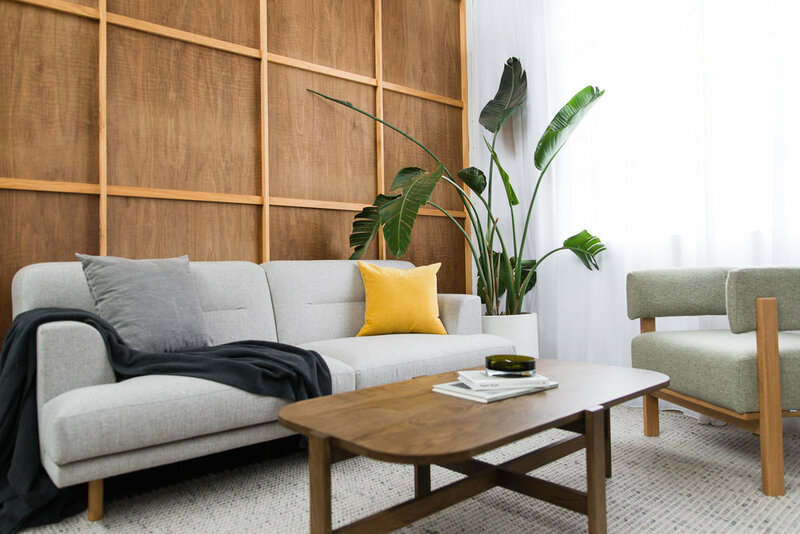 Each piece in Anaca Studio’s new collection exudes all the enduring quality and sustainable manufacture you would expect from a Melbourne-made contemporary classic. Timeless furniture, made to last and made to love. Flo armchair in Antico leather. Flo coffee table with our Emi pod. Bird's eye view of Flo armchair and coffee table. Showing off their beautiful curves. Narcisse mirror. Sleek lines and a minimalist and soft look. "Having taken some time to develop these pieces, I am so excited to add them to the Anaca Studio range. Some are more commercial, while others have a more residential feel. The armchair had to be really comfortable, and have a ‘light’ yet robust appearance – its timber surfaces introduce warmth into an office or lobby area, and looks right at home in a residential lounge too." The Poppy tables come in two heights and work great as a pair. - Photography Martina Gemmola - Styling Ruth Welsby. - Special thanks to Halcyon Lakes for the rug and The Apartment by Sisalla for the accessories. Earlier this year, we invaded the beautiful house of Honto Architecture to shoot our range and show off our Camille sofa in a new light. This modernist-inspired home designed by Damien Lui provides an elegant yet relaxed setting that perfectly complements the furniture’s style. We see no need to cocoon oneself in dark colours and hibernate over the cooler months. Instead, why not liven the mood with some fresh takes on classic pieces. Hope you enjoy the new vibes! Felix console - artwork by Hannah Fox. Camille sofa, 2.5 seater and ottoman in Velvet with Zoe table. Woven wall piece by Tammy Kanat. Elliot coat stand, Jules console and Emi pod. Perfect trio! Our Jules barstools with upholstered top for a comfy breakfast. Photography Martina Gemmola - Styling Ruth Welsby. All designs, artwork and images on this website are the property of Anaca Studio except where otherwise specified, and may not be copied, reproduced or used without approval.